From the moment you enter the gates you will be greeted by tradition, elegance and exclusivity that Plantation Bay Golf and Country Club in Ormond Beach offers. 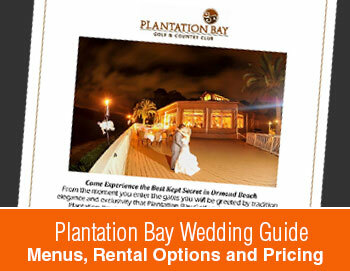 Plantation Bay is an ideal choice as your Ormond Beach wedding venue. Our newly renovated Clubhouse welcomes you with its sheer beauty, floor to ceiling windows and breathtaking panoramic lake and fountain views and has become one of the top wedding sites in Ormond Beach, Florida. However, you’re not just limited to Club de Bonmont, Plantation Bay offers several wedding ceremony sites that are conveniently located on property offering lake and golf course surroundings allowing you to select from the best wedding locations Ormond Beach has to offer. The clubhouse restaurant, Prestwick, is the perfect site for all rehearsal dinners, bridal showers, engagement parties and any other pre-wedding celebrations. Plantation Bay Golf and Country club will make your wedding a unique and unforgettable day. And our talented culinary team will create a mouth-watering feast to excite all your senses. We offer versatile menus and themes that are customized to accommodate your specific needs in addition to using our own professional touches to make every event a memorable one. Nothing is more important to our professional staff, than making your dreams come true. As Bride & Groom, you will receive personalized planning assistance and guidance to ensure that your event reflects your special personality. Whether you are planning an intimate wedding or an extravagant banquet, Plantation Bay Golf and Country Club is the place to be, specializing in all your catering needs, with big ornate eye-catching décor and seating for up to 200 guests. Centrally located in the seaside town of Ormond Beach, Plantation Bay is accessible from both Volusia and Flagler Counties and is minutes from St. Augustine, Palm Coast, Flagler Beach, and Daytona Beach making it one of the best destination wedding locations. Hotel accommodations are near-by so having a wedding at Plantation Bay is the right choice for you. Bring us your dreams, we’ll do the rest.